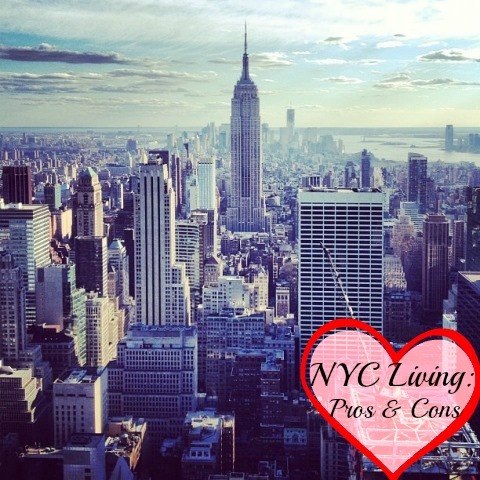 If you're an avid reader of my blog, I'm sure you've picked up on the fact that I've always dreamed of leaving suburbia life to live in the big apple (mentioned here, here and here). That desire stemmed from fond memories and experiences of going to college and getting my first job/internship there, hanging out with my friends in the city almost every weekend, and mainly the impelling energy of all its attractions allure almost everyone to live in NYC. But like anything else in life, dream vs. reality sooner or later hits us in the face and puts things into perspective. Diverse city: It is the true melting pot - meaning, it's very rare to get stared down by others if you look different than them because everyone looks different. This makes it more tolerable of others since it's full of every kind of person you can imagine. Best food mecca: A foodies paradise, it is known for the best pizza, best coffee, best pastries and its international authentic cuisine. Fresher water: It's been found that NY has the best water source. Having lived in other cities, I agree a 110 percent! Attractions galore for everyone: The city offers some of the best museums, theatres, parks, free concerts, summer flea markets, festivals, flower shows and parades...to mention just a few. And It's definitely the best city for people watching. A fashion capital: One of the most fashionably stylish cities in the world besides Milan, Paris and London. Transportation: Gives you convenient access throughout the city. It's not to be compared with many other cities. Convenient access to shopping: You're always steps away from great shopping which can develop into a costly habit if one is not careful. An energetic city: It's full of people trying to frenetically get things done. Fitness conscience: People treat working out like another full-time job. They stick to it and maintain a great level of physicality and health. Career oriented: Meaning there's a higher chance to fulfill your dreams here if you’re a hard worker. *If you're not used to crowds or a rushed life, NYC can definitely be an overwhelmingly exhaustive city, filled with people that might appear rude. It's not a city for the faint of heart. NYC people: Can be a real hit and miss - meaning that sometimes you find the nicest people in the world or on occasion can run into the most obnoxious individuals you've ever met. Personally, I meet more nice people than rude people in NYC who most of the time are willing to help if necessary. In other words, there are plenty of good Samaritans out there roaming those NYC streets despite what you've heard. Exhaust-filled/polluted air: As you dust your apartment there's a constant gritty black sandy dust re-depositing on your furniture. Not to forget on hot humid summer days the soupy, hot, filthy, smelly subways with the occasional mice and rat encounters that can be startling at times, especially for tourists. Noisy: Constant car horn blowing at all times of the day, fire truck sirens and subway noise make me find my ears ringing when I'm away from the city where there's complete peace and quiet. Occasional disrespectful delinquents: Who damage your property with graffiti or break and steal items out of your car. Astronomical rents: if you want extremely small dilapidated spaces with zero amenities, this is the city to come to, unless you're super wealthy willing to shell out over 1 million dollars for a 900-1000 sq. ft. apartment that sometimes needs a gut reno, or you have $10,000 - 25,000+ a month to rent it. And don't forget to add the additional cost of $300-600 a month if you're interested in parking your car in a lot for convenience or protection from the kleptos that break your car windows. However, be assured that your car will be graced with plenty of dings, nicks and scratches in two days from the garage attendants moving it to and fro from the spot for you. It's become a city made only for the super wealthy to live spectacularly. High stress level: Due to a very rushed life of getting out of people's way or keeping up with train schedules, mad traffic and/or looking for a parking space when you own a car (as we do) making it a struggle to arrive on time to engagements. And the need of quarters in case you do find a parking meter on the street costing a whopping $0.25 cents for every ten minutes. Or you can park at a garage for $ 30-60 an hour. Did I mention the pedestrian run-ins: People who seem to always want to walk right in to you no matter how far away they see you coming whether you're in their path or not. More taxes out of your pocket: For the privilege of living in the city aside from paying your typical federal, state taxes, you also have to pay an additional city tax. So it's like having a pocket full of holes, because the more money you earn, the more it goes right back out of your pocket before you even realize it, especially if you're self-employed like we are. We knew and calculated most of (the monthly fees for parking the car at a garage and the extra city tax came as a surprise) these pros and cons before moving to the city, but things always appear much simpler in theory. With all that said, do we regret our decision? No, because if we never experienced it, we would have always been wondering 'what if? What would it have been like if...' so we're grateful that we're able to dispel these thoughts knowing that the lifestyle just does not work for us at this point in our lives. Does that mean I/we hate NYC? Never may that happen! I'm a die-hard New Yorker and always will be. You can take the girl out of NY, but you can't NY out of the girl;) the hubby doesn't mind visiting it every once in a while, but not to live. Maybe one day we'll be one of those buying a penthouse for vacation in one of the Trump buildings. Thus, we're not turning our backs on NYC or saying never again - it's just that the lifestyle we dreamed of living in the big apple isn't in the budget as of right now. As people who like to move forward, we are ready to move on to the next 'dream of what if...' on our list. Which I'm sure will be mentioned on this blog as well at some point. Life is a journey. The most important reason for going from one place to another is to see what's in between and explore this amazing planet that we've been given as a gift. This is a timely post for my family and you've captured it spot on! I do feel that you can have the best of both worlds by living in the suburbs and getting into the city fairly quickly (relatively speaking). I KNOW you will get that vacation penthouse! No doubt!